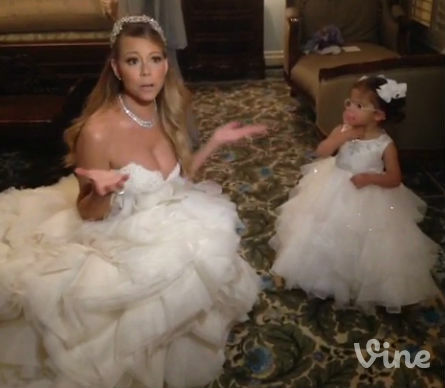 –Mariah Carey and Nick Cannon renewed their vows at Disneyland and the Vines she released from it are amazing. She tweeted some photos, too. (If you’ve been reading this blog for a while, you’ll know that I usually avoid linking to photos/videos that have celebrity children in them, but she obviously has no problem with you seeing dem babies.) She also really wants you to see how it took three assistants to get her into that dress! –Amanda Bynes just tweeted a photo of herself in a bra with the caption “I weigh 135, I’ve gained weight! I need to be 100 lbs!” Sigh. –Kevin Spacey is giving Kelly Clarkson a run for her money as Hollywood’s best photobomber. –Courteney Cox‘s face in these pictures is making my soul ache. -I wish the Breaking Bad Lego video game was really a thing. -Rapper Danny Brown didn’t miss a beat when a female fan jumped onstage in the middle of his concert to…um…pleasure him. –Natalie Portman and Michael Fassbender are teaming up for a new film adaptation of Macbeth and I want this going into my eyeballs RIGHT NOW. -In other casting news, Woody Allen will shoot a new movie in France with Emma Stone and Colin Firth. –Tara Reid just accused Lindsay Lohan of being a mean girl. -Is Jennifer Aniston delaying her wedding until Brangelina gets theirs out of the way? Anyone else think no one is more invested in keeping those three people tangled up in each other’s lives than themselves? -I love the outfit Zoe Saldana wore to the Star Trek photocall in Berlin. –Chris Brown actually thought it would be a good idea to participate in a new song called ‘Beat It’ because he’s an idiot. -Here are 27 reasons why you’re better than Carrie Bradshaw. -Also, Sarah Jessica Parker doesn’t own a cellphone any more. –Goldie Hawn joined daughter Kate Hudson for Almay’s Mother’s Day campaign. -Now that we’ve seemed to enter the angry, “I contributed to a Kickstarter and all I got was this lousy t-shirt” phase, NPR’s new Kickstarter campaign that tracks every stage of a t-shirt’s creation is even more amazing. -Tomorrow night is the season finale of Parks and Recreation. Check out a clip here. -Speaking of Parks and Rec, here are photos of Amy Poehler, Rob Corddry and Tina Fey having fun in the good ol’ days of UCB. –Lil Wayne has officially apologized (well, sort of) for his Emmett Till lyric. -Also, Lil Wayne was hospitalized and released again. –Scandal’s Kerry Washington and Tony Goldwyn took a history test and did surprisingly well. -Mountain Dew just pulled Tyler the Creator’s commercial amid accusations of racism. -I’m loving the new Arrested Development poster. Between this, news that Busy Phillips will guest star, and the new issue of EW, I’m softening my “I don’t need to order Netflix” stance. -Meanwhile, here’s our first look at Taylor Swift in the May 14 finale. Is she really that much taller than Zooey Deschanel? -Just in time for Zach Galifianakis‘ hosting gig on SNL this weekend, The Hollywood Reporter has released an oral history of The Hangover. Did you know that Jake Gyllenhaal, Paul Rudd, Lindsay Lohan and Jonah Hill almost starred in it? –Amanda Seyfried has replaced Liv Tyler as the face of Givenchy. –Beyonce singled out Fergie‘s daughter Princess Eugenie during her recent concert — even though Beyonce had no idea who she was. -Also, Beyonce made some diva-ish demands about her dressing room when she was playing London’s O2. -Speaking of divas, Lindsay Lohan has finally picked her rehab facility and finished packing. She says she’s bringing 270 outfits — for 90 days. -I like that Jake Gyllenhaal hangs out with End of Watch costar America Ferrera. –Miley Cyrus keeps giving interviews about Liam Hemsworth, which seems like a really bad idea when your relationship is teetering on a cliff. –Community’s Danny Pudi helped a fan hook up ’cause he’s just that nice. –Kristen Stewart‘s friends look exactly like you’d expect Kristen Stewart’s friends to look like. –Grimes turns down Steve Buscemi’s invitation to Easter brunch with Vampire Weekend in this new video. -Two new promos for Dexter’s last season have landed. -I liked this NYT article about The Office. “One final cringe” indeed. –Kanye West opens doors for no one — including his pregnant wife. -The new international trailer for Mortal Instruments: City of Bones has dropped. Needs more Nathan from Misfits.